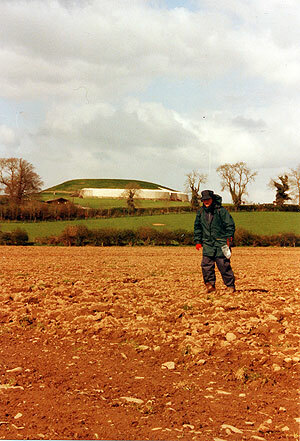 Volunteer walker on the Brú na Bóinne Fieldwalking Project in near Newgrange passage tomb. The structural elements of prehistoric houses and shelters were chiefly constructed of organic materials, very little of which survive for any length of time under normal conditions. However, we are fortunate that stone tools were used from earliest times through to the Bronze Age at least. These tools are usually of flint and a number of other rock types were also used. How artefacts enter the ploughzone (after Haselgrove 1985). In a ploughzone artefact scatter, finds that might normally be excavated from features on archaeological excavation sites have literally been ‘ploughed in’ to the ploughsoil with each tillage event. The surfaces and features with which they would have been associated are now largely destroyed and only the deepest elements of trenches, pits and post-holes survive below the ploughzone. The durable finds from the disturbed portion remain suspended within the ploughsoil and a proportion of these and later material are turned to the surface when fields are ploughed. So, paradoxically, one of the processes that has contributed to the destruction of these site types actually allows us to ‘see’ beneath the soil without excavating. In effect, the plough does the excavating for us. The stone tools will, of course, be disturbed from their original contexts but generally speaking, scatters of material within the ploughzone will largely retain their spatial integrity and will be recogniseable if a suitable systematic method of recovery is used. 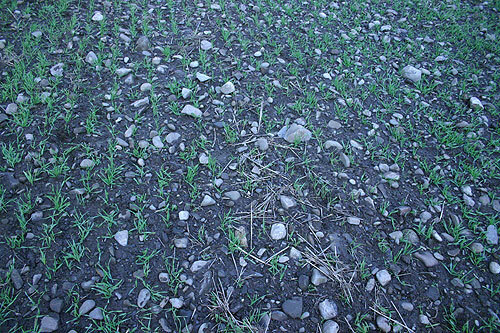 Weathered surface of a typical field during survey. Can you spot the flint? Research has demonstrated quite clearly that dense lithics scatters do not necessarily equate with settlement locations. In many cases, large scale working of materials took place at a remove from the settlement purely for safety reasons; freshly struck flint flakes and waste is as sharp as glass; not a material to have lying around the house in large quantities! There is a sequence which lithic raw material goes through from its initial quarrying and collection through to the finishing, use, resharpening, repair and eventual discard of tools. 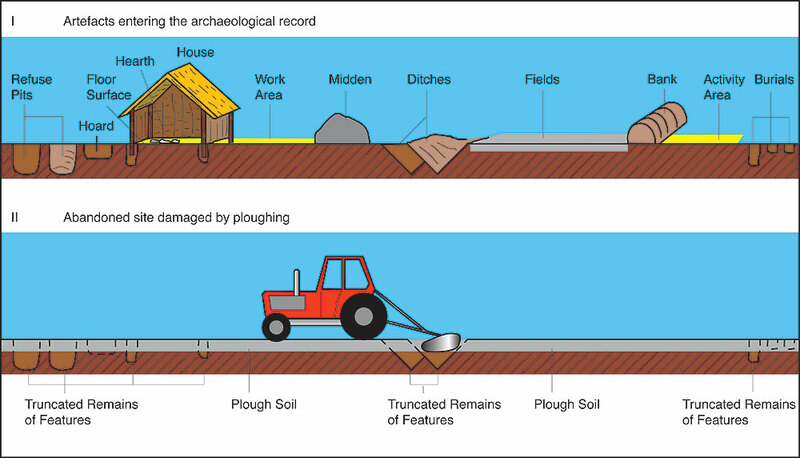 House sites are generally characterised by material that falls into the later stages of this sequence and there are generally larger proportions of tools, utilised flakes and blades, trimming (retouch) flakes (which often require sieving to recover on excavations) and prepared platform cores than would otherwise be expected. Close-up of some flint artefacts on a field surface. 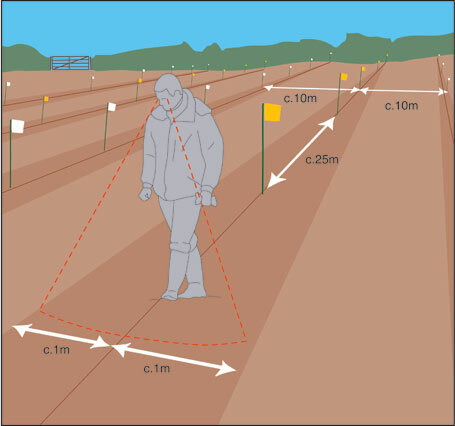 The most common method is to walk available (i.e., ploughed/tilled) fields using a grid system with regularly spaced transects crossing over the field, resulting in the sampling of the surface of the field. The spacing of the transects is determined by the objectives of the survey. If it is a priority to locate small ephemeral sites (like Mesolithic work areas) or establish the internal structure of larger scatters, then a relatively narrow spacing will be required. If, on the other hand, a rapid assessment of presence or absence of artefacts relating to a series of different periods along with a rough indication of their locations is required, perhaps as a preliminary phase in a multi-stage landscape project, then a wider transect spacing will be adequate. Each transect is subdivided into regular stints of a set length so each find will come from a recordable location, which facilitates the plotting of finds on distribution maps. For the purposes of the current research, walkers were spaced 10m apart and stint length was set at 25m. Each walker can effectively cover a corridor of c. 2m wide, i.e. 1m to either side of their path, resulting in 20% coverage of the surface of each field. The procedure adopted here for laying out the grid was to first choose the longest, straightest field boundary to act as a baseline and then, using a sighting compass, to set out the transects and stints at right angles to this. Transects and stints are marked with high visibility flags. Each transect was assigned a letter in sequence and within each one, each stint was assigned a number. Thus each stint will have a unique reference and finds are bagged according to what stint they come from. The transect letter and stint number are the equivalent of a context number on a conventional excavation. Grid used in each field in the Brú na Bóinne Fieldwalking Project. The results of the field survey, once plotted, can be easily replicated or tested under differing conditions. Careful use of the same field grid from field to field is, of course, essential for results to be comparable. Dull even light is the best for fieldwalking as there are no dark shadows created on the field surface. Dry weather is, of course the preferred option for surveying; not only is it more comfortable but when the field surface is wet, colours tend to change to a uniform dark brown. In well weathered fields, however, damp rather than wet conditions can serve to highlight the distinct colours and smooth surfaces of flint. The number of walkers surveying on the day is also recorded along with the transects that they walked. This is essential as different individuals tend to see different things on the surface depending on their levels of experience. A subjective measure of each person’s experience can be made in order to weight areas that appear to be of lighter relative finds densities if it is felt that finds were being missed. It is also important that fields be left for as long as possible before walking in order to maximise the effects of weathering. Frost helps to break up larger clods while rain and wind help to clean stones on the surface. Directly after the ploughing of a field very few artefacts will be visible. As with much other archaeological work, patience is rewarded and six to eight weeks of weathering will result in dramatic differences in surface artefact visibility. In the present survey, fields were usually walked some time after the crop has been sown, as a flat field surface is much easier to walk across than one that has only been ploughed. However, there is constantly a trade-off between the quality of the surface and the length of the crop. If a crop is left for too long it will damaged by walking on it, but generally speaking by this stage the crop is so high that it will begin to interfere with visibility anyway. The finds are washed, catalogued and plotted on field maps. Identification of scatters can take place once this has been done. 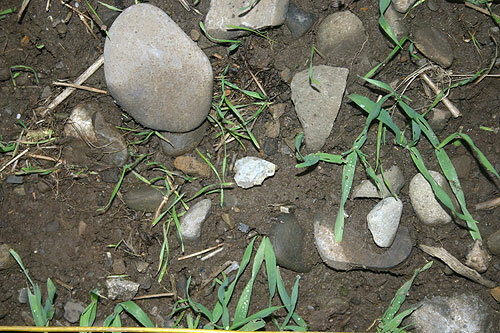 The assumption underlying this work is that the presence of a lithic scatter on the surface of a field is indicative of prehistoric settlement or work-related activity, not necessarily on that exact spot, but very close by. The presence of diagnostic artefacts can give broad indications of the dating of particular scatters while an analysis of the composition of ploughzone assemblages can identify the behaviours that were involved in their initial production. As has been mentioned already, lithic artefacts can belong to one of a series of stages in a sequence from initial collection through to eventual discard. Based on these observations, it has been established that a range of different activities can be recognised. Certain locations within the landscape may have been favoured above others for certain tasks. Although this technique is not necessarily as exciting or attractive as some more high-tech approaches like aerial photography, geophysics or excavation, it remains an excellent way to analyse the uses of a prehistoric landscape on a large scale basis and in an extremely cost-effective way. Results of such a survey can then be used to target more costly high resolution techniques on areas that have potential in the form of artefact scatters. This approach is extremely successful and has led to the discovery of the Rossnaree Enclosure.